This page contains photographs of some of the projects I have completed for my clients. 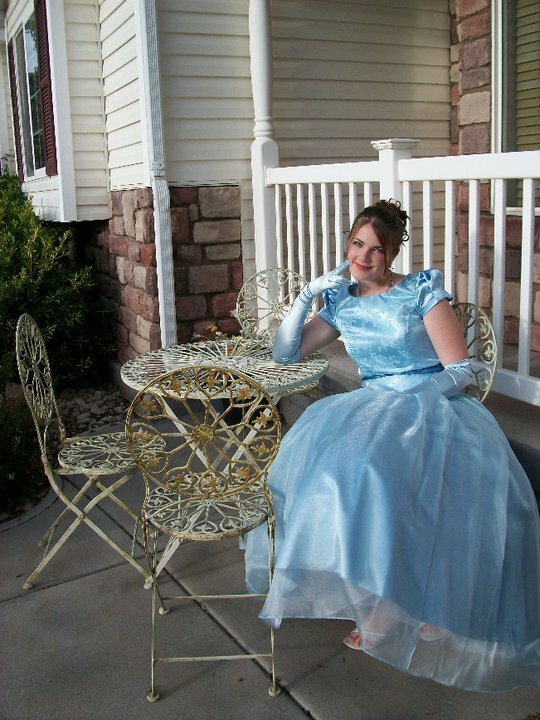 There are examples of Temple-fills, Custom-made Dresses (ones that I have designed and sewed from start to finish), Corset-backs, Bustles, Hems, and Other Dresses I have altered for one reason or another. I try to show before and after pictures of dresses that have been changed substantially, such as Temple-fills. I don’t include many pictures of dresses I have hemmed, as with a typical hem you would not be able to tell that it had been altered. All-over lace dress with ruching at bodice and appliqués on front and back. 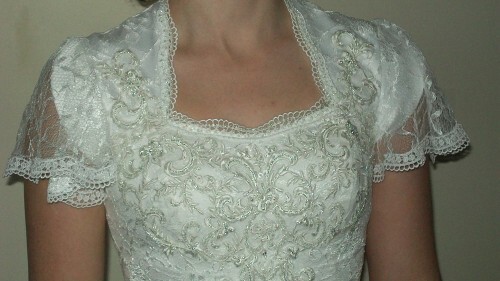 The bride wanted draped lace sleeves, but small satin sleeves underneath for coverage. She chose satin tulip sleeves so her arms wouldn’t be restricted. Dress WG9821 from David’s Bridal. Source. Front of altered lace dress. Back of altered lace dress. 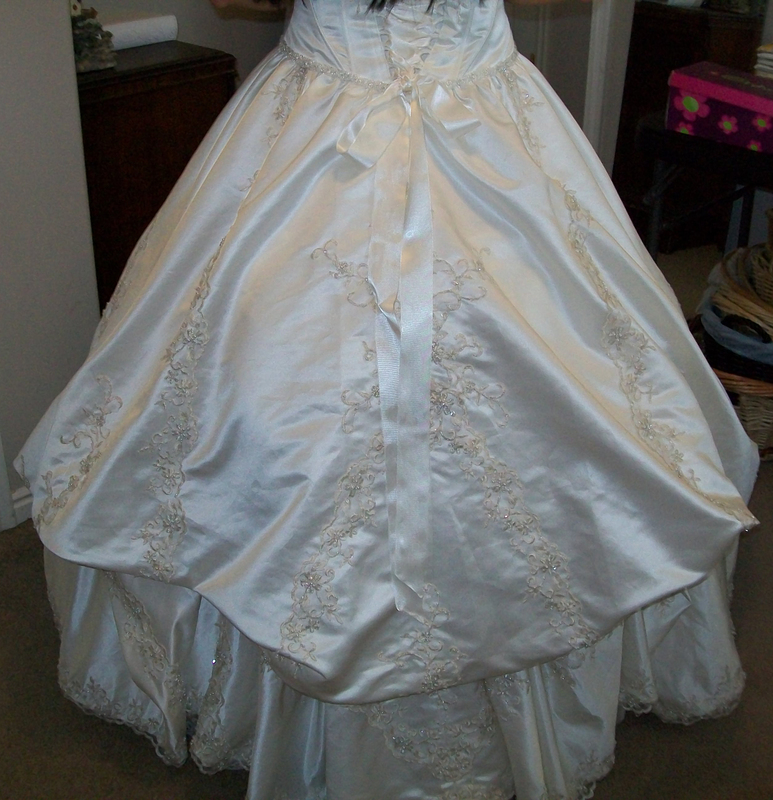 Ball gown with embroidered bodice, corset back, and pickup skirt. 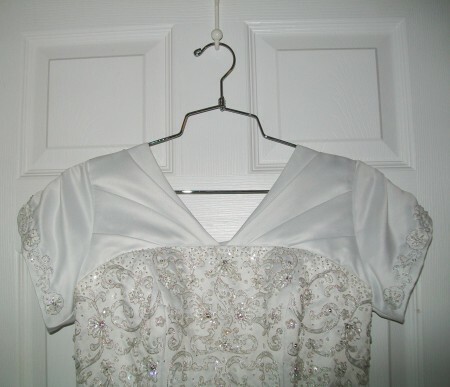 The bride chose pleats at the neckline on both front and back to match the pickup skirt. Tulip sleeves were sewn in the same style with added beaded appliqués. Front of altered embroidered dress. Draped-pleated taffeta gown with points at front neckline. 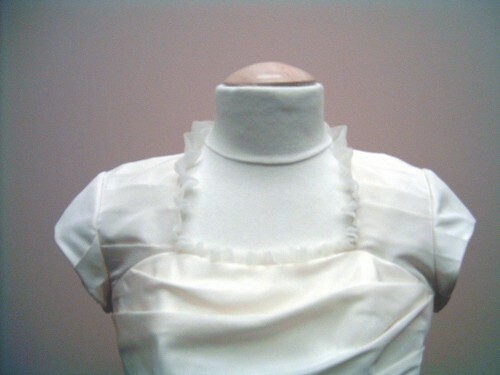 The bride wanted to add an a organza stand-up collar around the neckline that tapered into and across the front. 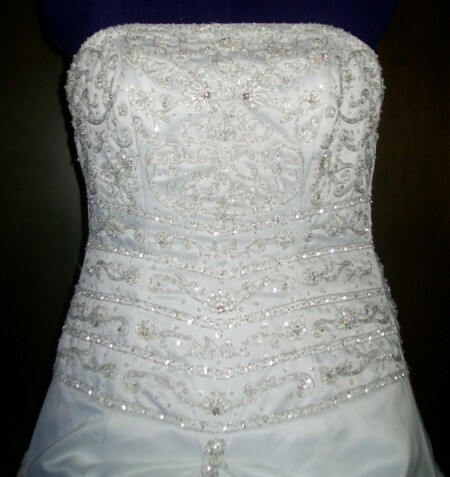 The points were taken in to create more of a sweetheart neckline. Dress P9345 from David’s Bridal. Source. 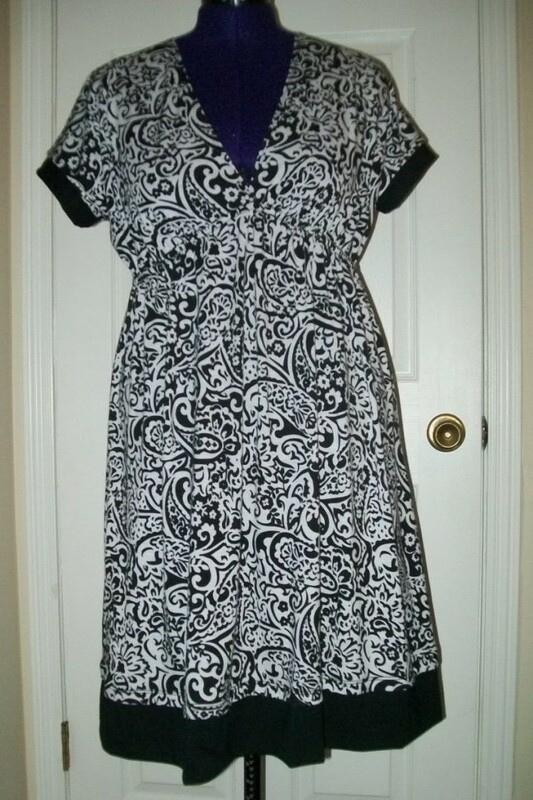 Front of altered pleated dress. Back of altered pleated dress. This dress was designed for a high school prom. 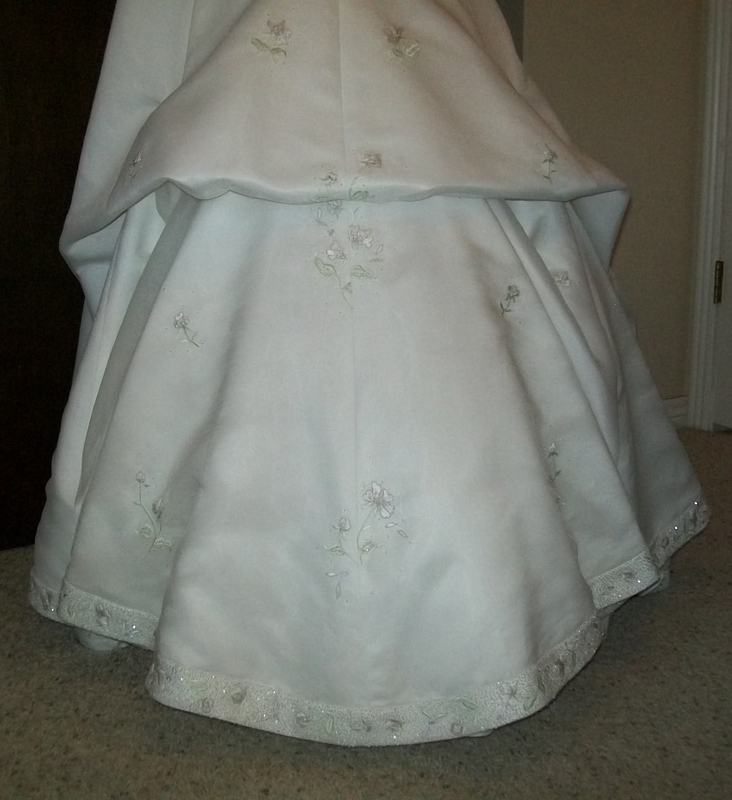 The bodice was made of satin with a rose motif and the skirt was sewn with a sparkly organza overlay. 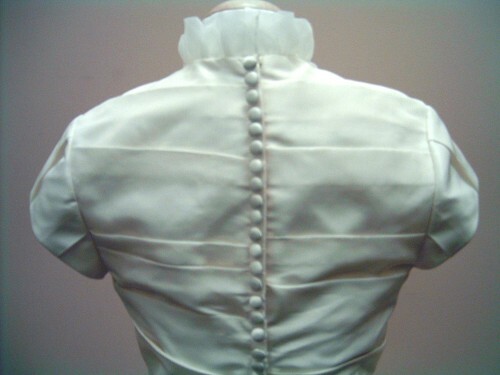 It was made to lace up with ribbon rather than zip up the back, and more of the ribbon was added around the natural waist. 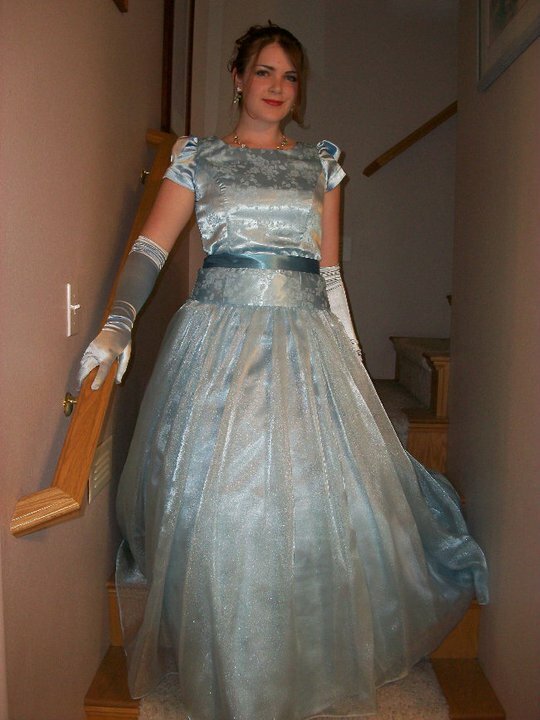 Front of baby blue prom dress. Back of baby blue prom dress. A lot of girls opt to change their zippered dresses to ones that lace up. Dresses with corset-style backs are not only very pretty; they are also more versatile. 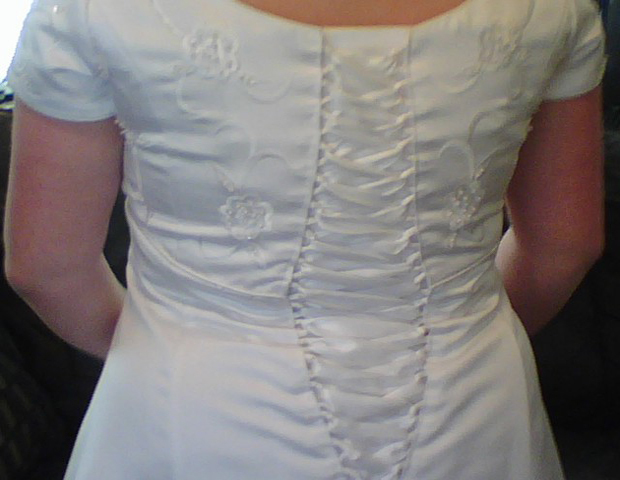 Corset-backs are much more adjustable than zippers or buttons, so girls with this type of dress don’t have to worry about gaining or losing a little weight, which is common for a stressed-out bride! When a dress can’t be let out enough to fit, a corset-back is a great option, and can sometimes make a dress fit several sizes larger. 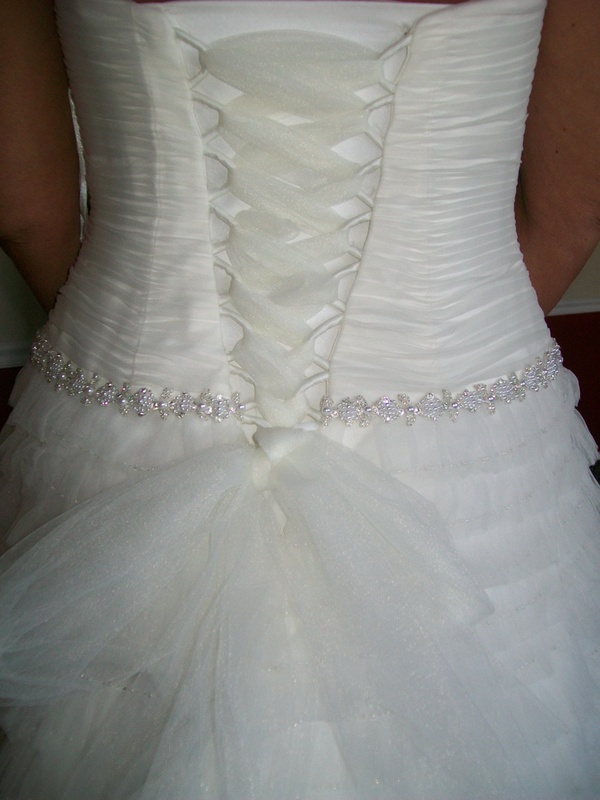 Corset-back with bow on champagne and ivory dress. Corset-back in a diamond shape. Corset-back dress laced with tulle. 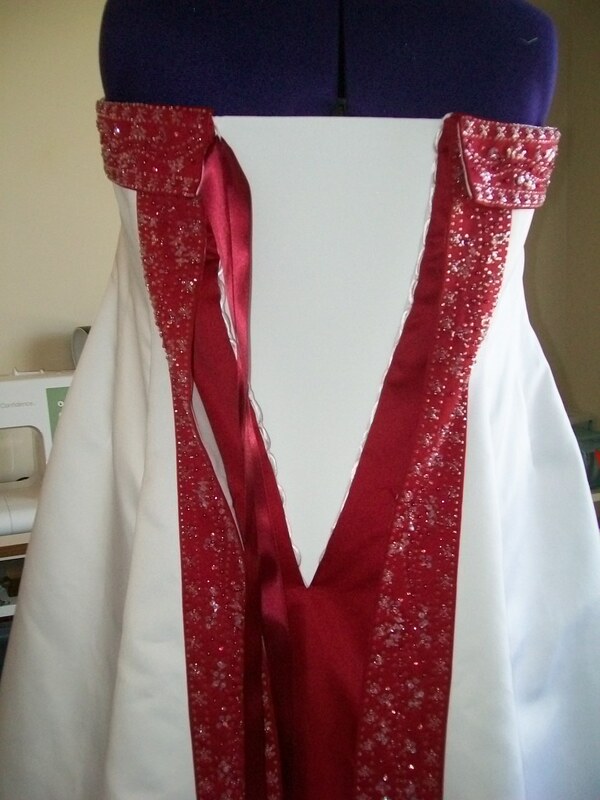 Unlaced corset-back on red and white dress. There are four main types of bustles: French bustle, Overbustle, Ballroom bustle, and Austrian bustle. One bride may choose an entirely different bustle than another bride for the same dress. Bustles depend on the type of dress and material, the length of the train, and the bride’s preferences. A bustle isn’t only a way to keep the train of a dress off the ground – it can also create a whole new look for the dress. French bustle on chapel-length train. French bustle on cathedral-length train. 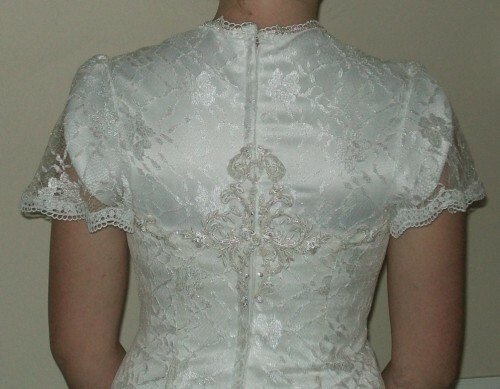 Wedding gown with trains are often only hemmed in the front of the dress, and then tapered back into the train so no length in lost in the back. There are many different types of hems, though the most common ones for bridal gowns use horsehair braid (not actually made of horsehair these days) to keep the shape. 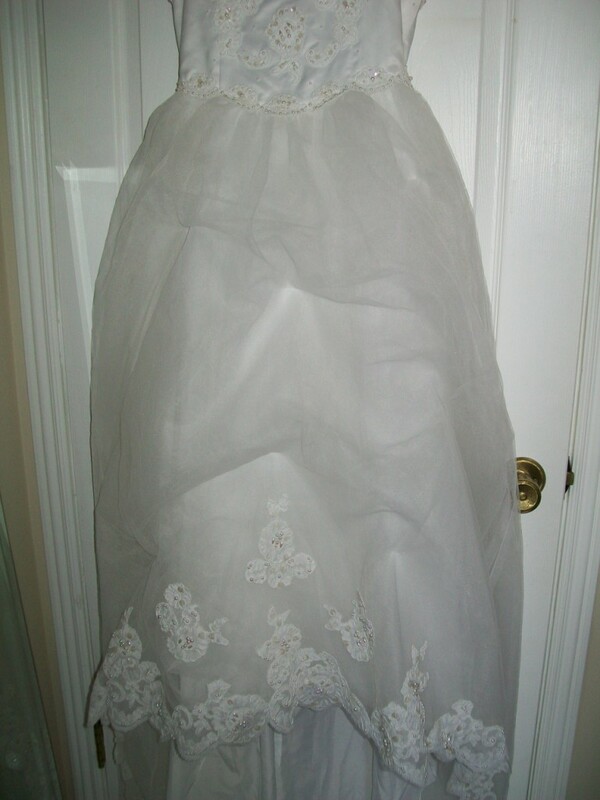 When a dress has a bubble hem or lace across the bottom, brides often think that their dresses can’t be hemmed. But this isn’t true; there is more than one way to hem a dress. It’s better to ask if your dress can, in fact, be hemmed before you purchase the tallest shoes you can find! Flower girl dress shortened with a pick-up technique. 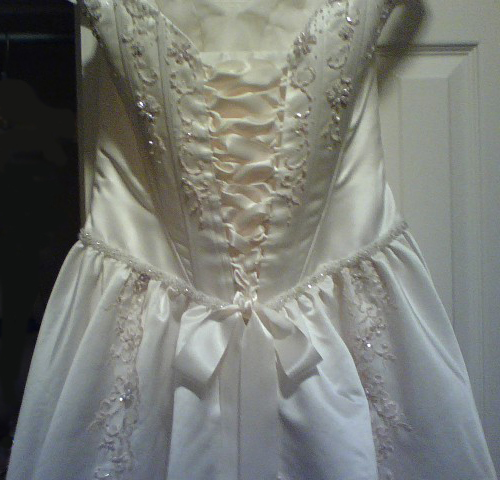 I am often asked to work on dresses and projects other than just bridal and prom gowns. Sometimes a little adjustment here and there can turn a never-gets-worn piece of clothing into an everyday favorite. Knit dress with color blocks added to sleeves and hem for more coverage.